SleepPRO Custom: Lab Custom Snoring Mouthpiece "SP2"
If our SP Standard mouthpiece helped with your snoring, you may want to order the laboratory Sleep PRO Custom. This is a special mouthpiece made from a laboratory-grade impression of your own teeth. Expect a perfect fit. It's thin, it's very comfortable, and the best part - it will help you to stop snoring. Easy self fitting directions are included with the kit. Save time and costs of alternate custom treatments; do it your self! 1. We will send you a professional dental impression kit. Simply take an impression of your teeth. You can do this at home. It's easy and instructions are provided. 3. We will mail you your SleepPro2 once its ready and you can kiss snoring goodbye, and get used to enjoying a good night's sleep. Please use the trial SleepPRO mouthpiece first to assure that your snoring stops before making your final dental impression. 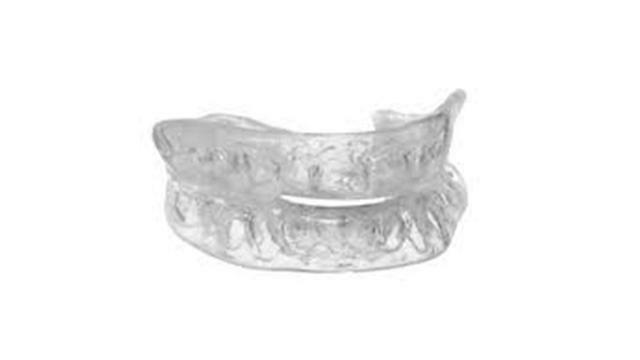 If you do not see improvement with the trial mouthpiece, contact us at info@mouthguardstore.com for help or return information within 30 days of receipt of the mouthpiece. Please follow instructions and watch the fitting videos for more help. I am delighted with the SleepPro 2. I wake up much less uncomfortable than I have ever done with either of the boil-and-bite alternatives I have tried. I have found that it stays in place all night without exception and I really like the 'hole' in the front that allows for breathing through the mouth - making it suitable even when I've been congested with a cold. The process for having it made was simple and very quick - this had been a concern of mine (that it would be difficult or wouldn't fit when it was returned) but the instructions were so clear, even I couldn't get it wrong! I received my SleepPro 2 this morning and it is a perfect fit, thank you. Taking one's own impressions was very simple with your easy to follow instructions and I am very impressed with the quality of the finished article. After I started to use the SleepPro 1 my sleep quality has improved dramatically. I don't snore, grind my teeth or bite my tongue and I feel so much better the following morning. I bought a splint (SleepPro 1) from you a few months back, but for one reason or another didn't get round to fitting it. For a month now I've been sleeping on the sofa. I finally bit the bullet and fitted it myself last night. Went to bed a bit apprehensive. It wasn't anywhere near as uncomfortable as I thought it would be. Fell asleep quite quick. The 64,000 dollar question...did it work? DARN RIGHT IT DID !!!!!!!!!!!!!!! FANTASTIC!!! My wife said she didn't hear a peep out of me all night!! The mouthpiece stayed in all night. I had a corking nights sleep. Just want to thank you from the bottom of my heart. Fantastic product. Can't recommend it enough. Thanks once again, SleepPRO2 next!